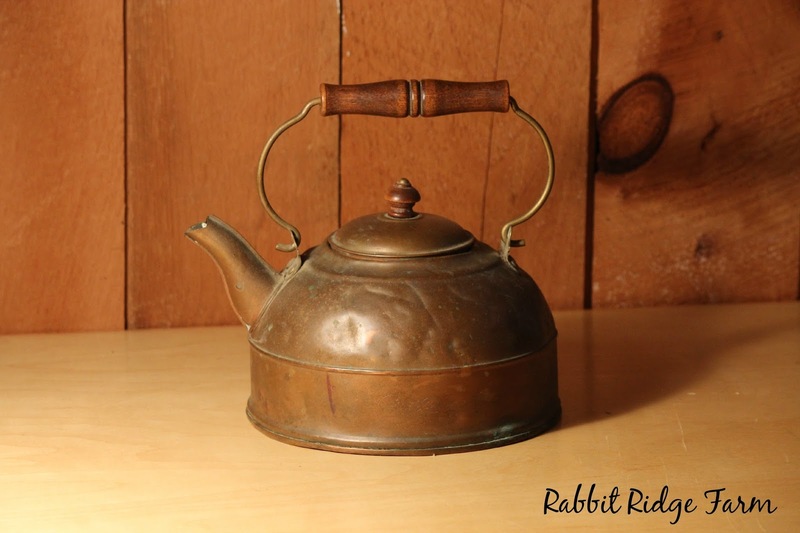 Awhile ago I told you all about this cute little kettle I purchased at an antique store in Maine. At the time we were still in school and even getting started on our new place was just a dream. Now we’re staying at a family place with easy access to our property and have begun the design for our new homestead! I also have finally started using the kettle! It’s actually sitting on the wood stove as we speak. We still have a long way to go to get into our own home but this is progress! Now onto the kettle. Pretty rough looking right? 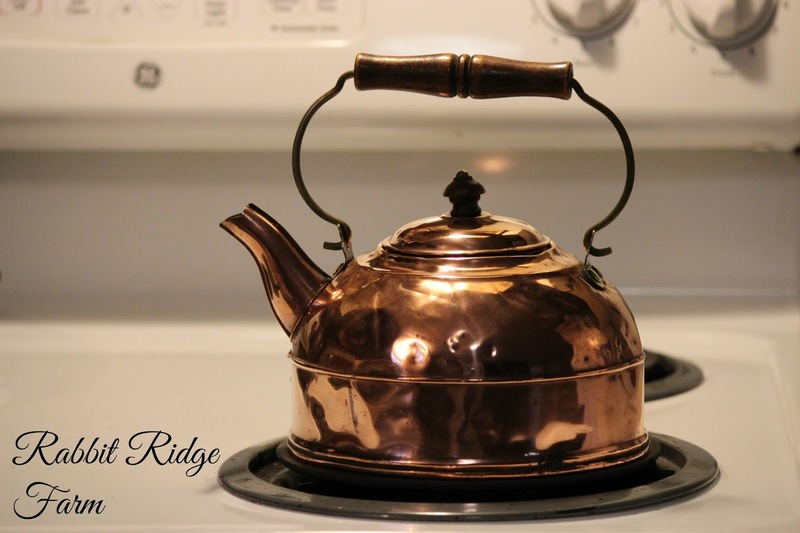 It’s a pre-1940s Revere Ware copper kettle that probably hadn’t seen polish in decades. I picked it out because I love the look of copper. 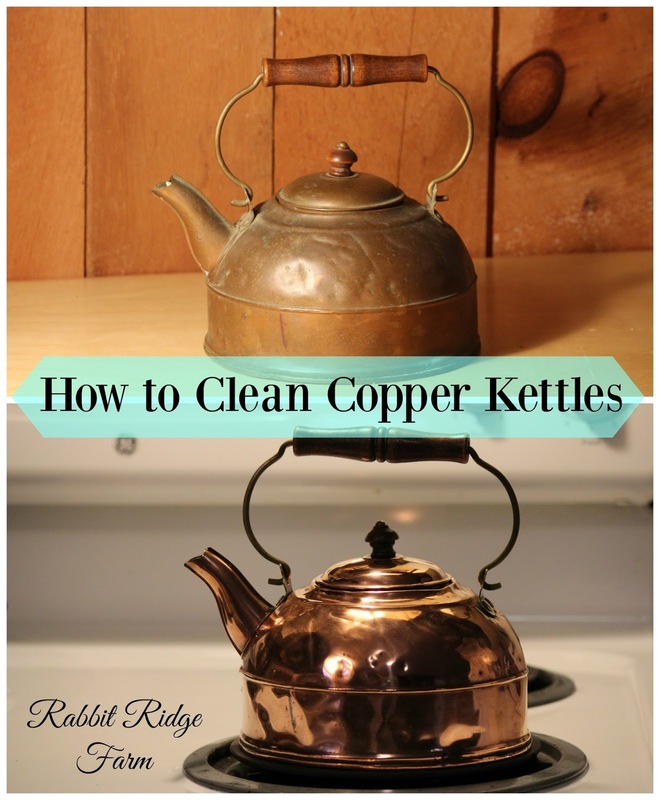 Plus copper conducts heat very well so this kettle heats my water quickly. To clean it I tried a couple methods. First I tried vinegar and salt. I stirred some of the salt into the vinegar but also used some as an abrasive. To my surprise it worked! In the photo below the shiny spot on the kettle has been rubbed with the salt and vinegar mixture. The shiny spot on the lid however was cleaned with Brasso. The Brasso required less vigorous scrubbing and gave an even more mirror like finish. It can be purchased cheaply on Amazon here. That being said if you’re just touching something up or have a kettle that has been regularly cleaned instead of being coated with years of dust and grime. The vinegar and salt should work just fine. Stir until most of the salt is dissolved then dip a rag or old toothbrush into the mixture trying to get some of the undissolved salt onto the cloth. You want the rag to be moist but not dripping. You’ll have to put some work into it and you can use more salt as an abrasive as needed. It takes awhile but it’s totally worth it! *** Note this post contains affiliate links that contribute a tiny amount of money to our homestead. We never recommend products we haven’t used ourselves. 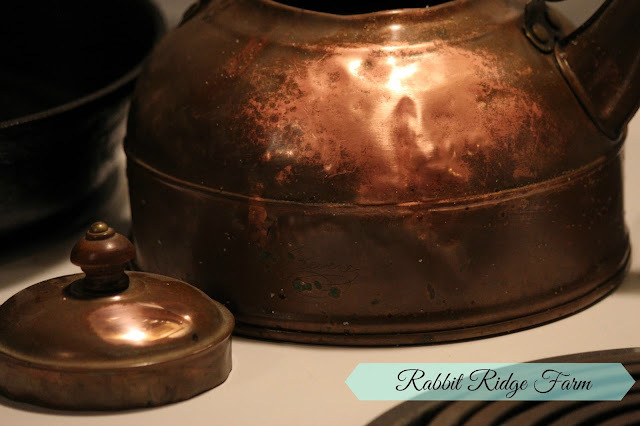 2 Responses to "How to Clean Copper Kettles"
« Is Your Homestead Ready for a Winter Storm?